With Hope for the Environment Crushed, What Can We Do? It’s time to stop hoping lobbying will ever convince those in power to stop burning fossil fuels, polluting our air and water, and destroying nature. For decades, even “lesser of two evils” political leaders have permitted accelerated attacks on our environment. A few have put band-aids in place; none have acted to reverse our course. With Trump and other reactionaries gaining power around the world, policies will only get worse. It’s time to stop hoping for a mass shift in consciousness, a voluntary cultural adoption of a sane and sustainable way of living. Despite widespread understanding of looming environmental crises, voluntary simplicity and conservation have never gained mainstream traction. Nearly sixty million Americans just voted for Trump, who promised to gut even the tiny bits of environmental protection the US does have in place. Collectively, no matter the true costs, we are unwilling to sacrifice our comforts and luxuries. No amount of education will overcome this. When we can’t rely on others to make necessary change, we’re left with direct action. Those of us serious about protecting present and future life on the planet must leverage our small numbers to shut down fossil fuels, polluting industries, and nature-destroying machines. This may sound radical, and that’s because it is. We need to go to the root of the problem and win the war there, rather than fight (and mostly lose) battle after battle against endless manifestations of ecocide. Deep Green Resistance has realistically assessed the resources of the environmental movement, the opposition we face, and the time we have left before runaway climate change and ecological collapse have gone too far to stop. Our response, Decisive Ecological Warfare, is a plausible strategy to stop the rich from exploiting the poor and the powerful from destroying the planet. Industrial infrastructure is surprisingly vulnerable: sprawling and impossible to protect everywhere. Though we’ll never have large numbers of people fighting on the front lines, they can be disproportionately effective by attacking carefully chosen critical bottlenecks. Don’t let despair drive you to retreat; there’s too much at stake. This is a call-out for people to join the fight on the side of the living. Read our strategy. Read our book. If you’re in a position to carry out direct action to stop the destruction, know that there is an aboveground movement building in support of your work. If you can’t be on the front lines, for any of a hundred perfectly valid reasons, join us in the aboveground as a volunteer, as a member, or as a financial supporter. 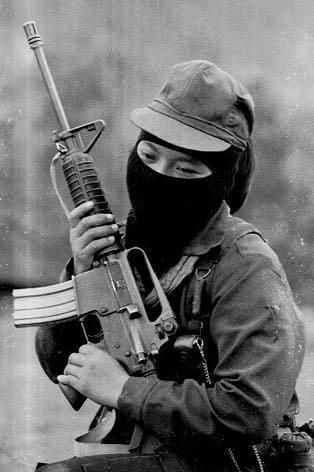 Help us support the militant resistance the planet desperately needs. Posted on November 10, 2016 Categories Strategy & AnalysisTags DGR writing & analysis, 6: Civilization is irredeemable, 17: Don't base decisions on fence-sittersLeave a comment on With Hope for the Environment Crushed, What Can We Do? Max Wilbert and other members of Deep Green Resistance Seattle participated in a May “ShellNO” protest against Shell’s arctic drilling rig. 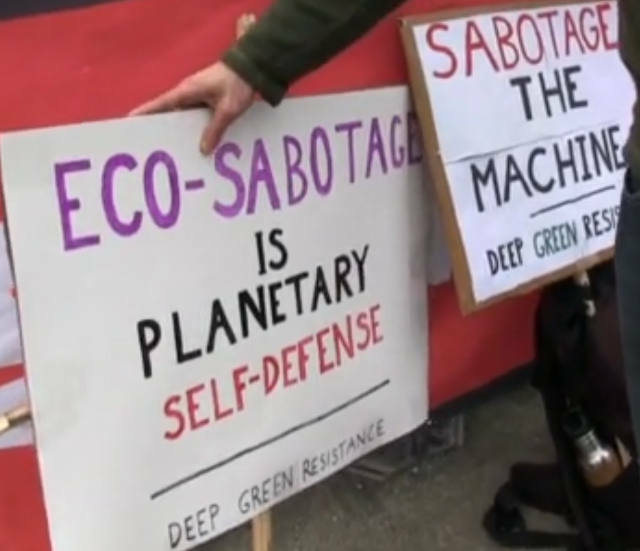 Their display of signs reading “Sabotage the Machine” and “Eco-Sabotage is Planetary Self-Defense” attracted a lot of attention. Elliot Stoller conducted a short video interview in which Wilbert explains his concern about ineffective tactics and strategies in the face of dramatic threats to biodiversity, climate, and social justice. Wilbert discusses DGR’s radical evaluation of systems of power and what might actually work to alter their destructive course: targeting critical communication, electrical, and oil infrastructures, and addresses some common questions about what that means for the safety of activists who undertake such work, and what sort of life humans can live without the comforts and elegancies of industrial civilization. Please share this radical analysis, and help put sabotage on the table as a viable tactic in our struggle for life and justice! Celebrate achievements, or be lulled by hope? Those of us who care about life and justice are often, understandably, disheartened by all indicators of the health of the planet continuing to worsen. Equally understandably, we tend to grasp at those rare signs that we may succeed in turning things around: a big turnout to a protest, hundreds of thousands of signatures on a petition of national significance, or a year in which carbon emissions don’t increase over the year before. We need fuel to keep us going as activists ― reason to believe our work can make a difference. We need to nourish our resistance by celebrating achievements. We know this is a long-term struggle and that we won’t achieve ecological sustainability overnight, that we must set strategic goals and allow ourselves to feel accomplishment when we complete tasks that contribute to meeting those goals. But it is dangerous to conflate a possible support base, willing to make symbolic statements, with an actual effective movement. It is dangerous to confuse things-getting-slightly-less-bad with actual victory. We need to keep grounding ourselves in a big picture view of reality and of our strategy, tactics, and goals, and regularly ensure that our daily actions are consistent with a carefully thought out plan. When we reach milestones in enactment of our strategy, we should review them with pride and satisfaction, and build on them to further goals. But we shouldn’t seize on any bit of vaguely good news to make ourselves feel better in a bout of self-delusion. We recommend reading the new post “Deep Green Resistance Seattle: The Climate Movement is Failing. Here are Two Models to Turn the Tide.” It opens with the Lauren Hill quote “Fantasy is what people want but reality is what they need,” then examines the lulling effects of a one-year leveling off of carbon emissions and of the excitement generated by the #ShellNO campaign. 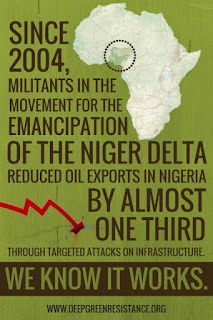 It puts these in context of what needs to happen, and introduces two model strategies ― CELDF as an aboveground approach to direct democracy in the US, and MEND as a belowground campaign of strategic sabotage against the oil industry in the Niger Delta. And if you haven’t yet, read the strategy of Decisive Ecological Warfare. If you’ve been uncertain as to how your activism fits into the big picture, these two links are a great starting point for you to contemplate how you can be most effective. Posted on July 19, 2015 Categories Strategy & AnalysisTags DGR writing & analysisLeave a comment on Celebrate achievements, or be lulled by hope? The DGR Southwest Coalition recently held their annual Southwest Gathering, sharing skills & good food, and engaging in many discussions & strategy sessions. As part of the gathering, Deanna Meyer of Deep Green Resistance Colorado joined Brian Ertz of Wildlands Defense to discuss their recent campaign against a Castle Rock mega-mall development. We’ve reported here a little bit on the struggle, and are excited to share this video of Meyer and Ertz describing the campaign in more detail. The campaign initially petitioned the developer to “do the right thing”: delay construction until June, so that threatened prairie dogs on-site could be relocated with the best chance of survival. Though this would leave the prairie dogs as refugees, displaced from their homes and with the rest of their community killed, at least they would have a chance to try to rebuild their lives. When the developer responded by poisoning the prairie dogs en masse (along with many others, human and nonhuman), the campaign focused on saving those who were left, and on creating an example of the developer by inflicting as much pain as possible. The campaigners were unable to stop the development or to save all the prairie dogs, but their dedicated grassroots organizing succeeded at achieving their secondary objectives. They forced the developer to halt construction for months, allowing workers to rescue those prairie dogs who survived the mass slaughter. They’ve probably cost the developer millions of dollars and countless headaches, demonstrating the practical value to future developers of doing the right thing from the start. Michael Carter of Deep Green Resistance Colorado Plateau, fueled by anger and despair but with only The Monkey Wrench Gang for guidance, carried out acts of sabotage in his youth against industrial encroachment on wilderness. He spiked trees, sabotaged road construction equipment, and cut down billboards. Though he doesn’t regret his impulse to protect life and strike back against the machinery of industrial civilization, he does regret his lack of strategy, big-picture thinking, and basic security culture. Now older, wiser, and working as an aboveground activist, Carter reflects on those underground actions, what he wishes he’d done differently, and what needs to be done today in the face of even more desperate environmental circumstances. This interview is a fascinating read, giving a glimpse into what might lead someone to consider illegal forms of resistance such as property destruction, the pitfalls they may encounter if they don’t prepare properly, and what it will take to build a larger culture of resistance. We didn’t know a lot about environmental issues or political resistance, so we didn’t have much understanding of context. We had an instinctive dislike of clear cuts, and we had the book The Monkey Wrench Gang. Other people were monkeywrenching, that is, sabotaging industry to protect wilderness, so we had some vague ideas about tactics but no manual, no concrete theory. We knew what Earth First! was, although we weren’t members. It was a conspiracy only in the remotest sense. We had little strategy and the actions were impetuous. If we’d been robbing banks instead, we’d have been shot in the act. Nor did we really understand how bad the problem was. We thought that deforestation was damaging to the land, but we didn’t get the depth of its implications and we didn’t link it to other atrocities. We just thought that we were on the extreme edge of the marginal issue of forestry. This was before many were talking about global warming or ocean acidification or mass extinction. It all seemed much less severe than now, and of course it was. The losses since then, of species and habitat and pollution, are terrible. No monkeywrenching I know of did anything significant to stop that. It was scattered, aimed at minor targets, and had no aboveground political movement behind it. In November, Admiral Michael Rogers spoke to the House Select Intelligence Committee on Cybersecurity. Rogers, the National Security Agency (NSA) Director & U.S. Cyber Command Commander, spoke on the vulnerability of U.S. infrastructure to cyberattacks due to the proliferation of network technologies which are relied upon for that infrastructure’s functioning. Sectors of the economy vulnerable to cyber attacks run the gamut, from energy to oil and gas to government to aviation. In his assessment, no major part of the interconnected global economic system is not vulnerable to cyber attacks. While this hearing focused mainly on the threat that foreign nation states pose to the U.S., the topic of non-government groups committing catastrophic attacks on infrastructure was brought up as well. In comparing the cyber threat to the nuclear threat of the Cold War era, it has been determined that the cyber threat is a much greater risk because of the ease with which groups with few resources can gain the tools necessary to commit potent attacks, whereas obtaining nuclear weapons is much more difficult. Watch the full hearing to learn more about cyber vulnerabilities of infrastructure. Will Falk of Deep Green Resistance San Diego recently wrote an excellent piece on our dire situation, the ineffective and thus unrealistic solutions proposed by “experts”, and what it will really take for us to address the interlocking problems of ecocide, genocide, and other oppressions. His essay is a clear call to and explanation of the necessity of direct action, for those who can be on the front lines and for those who can play an invaluable supporting role.